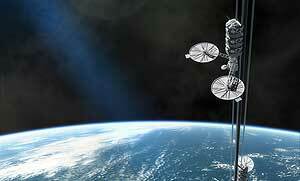 A space elevator is a proposed type of space transportation system. Its main component is a ribbon-like cable (also called a tether) anchored to the surface and extending into space. It is designed to permit vehicle transport along the cable from a planetary surface, such as the Earth's, directly into space or orbit, without the use of large rockets. 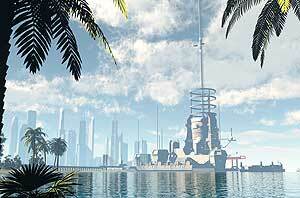 An Earth-based space elevator would consist of a cable with one end attached to the surface near the equator and the other end in space beyond geostationary orbit (35,800 km altitude). The competing forces of gravity, which is stronger at the lower end, and the outward/upward centrifugal force, which is stronger at the upper end, would result in the cable being held up, under tension, and stationary over a single position on Earth. Once deployed, the tether would be ascended repeatedly by mechanical means to orbit, and descended to return to the surface from orbit. Situated on the Earth's equator, the base station would receive cargo and passengers by rail and sea, and it's certain that a city would spring up associated with the ease of access to space. The elevator cars would be substantial affairs, travelling the cables to and from orbit, carrying freight and passengers. Power would come from microwave base stations on the Earth, received by large collectors on the cars to power linear induction motors. At the halfway point on the journey to geosynchronous orbit, a space station would be constructed, with cars from the Earth docking on the bottom, with cars leaving from the top. 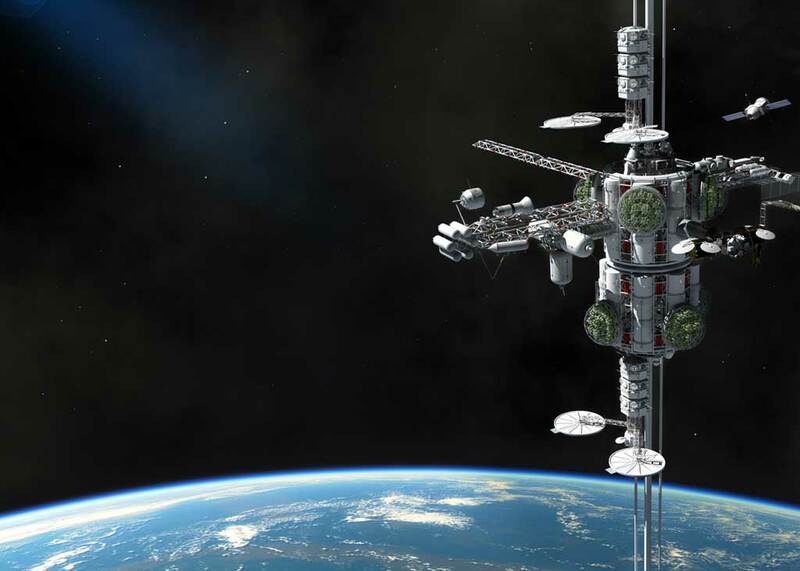 The station would have facilities for the assembly and fuelling of spacecraft, biodomes for food and oxygen, and recreational and habitation facilities. 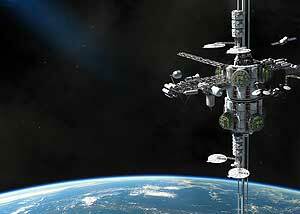 In geosynchronous orbit, a captured asteroid would provide the cable counterweight, keeping the system finely balanced. The cable itself would be made from material mined from the asteroid, and extruded downwards towards the Earth - a distance of 36,000km. 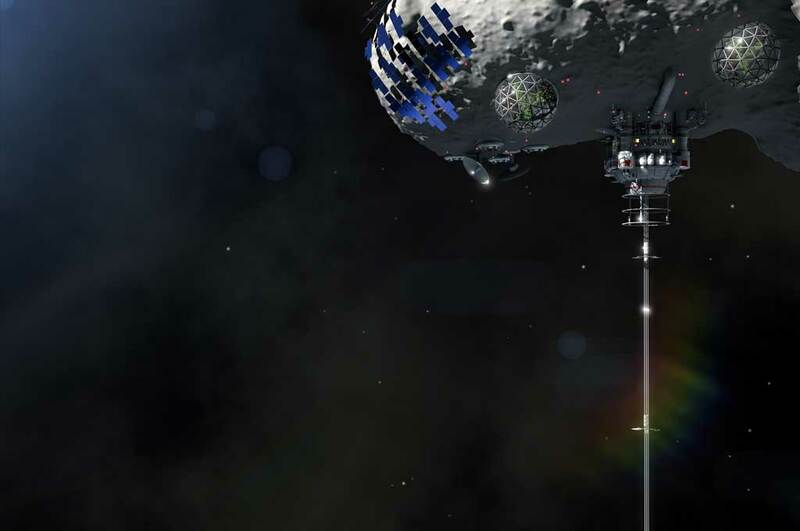 Spacecraft would use the asteroid as a base for missions deeper into the Solar System. Images appeared in the Danish magazine "Illustreret Videnskab" (Science Illustrated).